The cost for building new capacity to meet our future electricity needs is currently projected at 14 Trillion Dollars over the next 20 years. 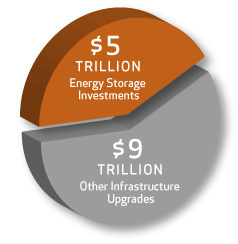 (International Energy Agency, World Energy Outlook 2010, p.227) With energy storage systems [ESS] costs rapidly decreasing, almost $5 Trillion of this investment has a great potential of being allocated to different ESS solutions offering a wide range of possibilities for renewable energy integration and for future with cleaner energy outlook. Our current total electric grid power utilization is only around 60% with total power capacity being approximately 80% higher than our current total demand. The problem is that this demand is not equally distributed throughout a 24-hour day and therefore we have to be adding new capacity just to meet those peak demands. We are running high polluting coal plants at peak day time hours and we have unused wind turbine energy potential at night. The problem to solve is how to economically store that cheap clean energy at night (or when it is not needed) and use it during peak demand periods. Clean energy sources are usually the lowest cost energy producers, but we don’t have control of when the sun shines or wind blows. With huge investments and innovations happening in the fields of wind, solar and other renewables, it’s more critical than ever to design new ways of storing the output and maximizing alternative energy sources. The market need has never been greater. Through an easy-to-implement and economical Li-ion battery storage system with the capacity to store and deliver energy on demand across multiple applications, BeVault is on the cutting-edge of a market that is primed to explode.